Plan your Thanksgiving celebration in Mexico Beach! Fall is in full swing, even on the Gulf Coast, but the sun and sand are just as beautiful as ever! Our tiny oasis of Mexico Beach is preparing for a holiday season filled with gorgeous days by the Gulf of Mexico and fun events that are sure to make this year a memorable one. Consider the Unforgettable Coast™ for your backdrop to the 2012 holiday season. Plan a gathering for the whole family and join us for Thanksgiving. Stay in one of Mexico Beach’s numerous rental homes, and bring everyone along for a break from the norm this year. Even our fellow Floridians will love a “staycation” on our shores, so why not call family and friends for a special holiday gathering in one of the country’s most untouched coastal getaways? Out-of-town guests can meet for holiday fun while exploring our charming fishing village, a perfect adventure to share with close friends and loved ones. You can come together for a delicious meal around the table, and maybe even infuse a little fresh Mexico Beach Gulf seafood into the mix! Or, if you aren’t in the mood to cook this year, try two of our favorite local restaurants for your Thanksgiving Day cuisine! The Thanksgiving Day hours for Toucan’s are 11 a.m.–7 p.m., and Sharon’s Cafe is also open from 6–10 a.m. Plan a family photo session on our sugary white sands––they’re great for Christmas cards! A bike ride along the coast is the perfect way to end the day, and don’t forget to share the sunset with those you’re most thankful for. Festive holiday events are some of the best things about the season. Don’t miss the Mexico Beach Annual Christmas Tree Lighting on December 2. And don’t forget about ushering in 2013––then doing it again––at Mexico Beach’s “Celebrate Safe, Celebrate Twice” event! While Mexico Beach lies in the Central Time Zone, our neighbor, Port St. Joe, is on the Eastern Time Zone border. To ensure that everyone has a great and safe time, free trolley services will be available from Port St. Joe to Mexico Beach, so you can count down to the New Year twice in one night! 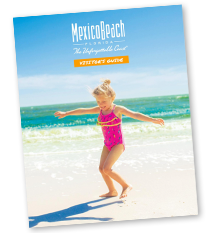 Get away from it all this holiday season and come home to Mexico Beach. From relaxing days in the sun, to a bike ride down the coast, to coming together around the table for a holiday meal with the people you love, let Mexico Beach be your escape!